You no longer need to travel to the jungles of Asia to experience the wonders of the panda. Click here to play! Double Panda is an exciting journey into the deep that you can experience in the comfort of your own home. This wonderful 5-reel slot is played across 25 unique pay lines, with the more lines activated meaning more chances for spinning up winning combos. The Panda is Wild and can therefore be substituted for any other symbol on the reels except Scatters. Land all five on an active pay line and win yourself 10,000 coins! The Bamboo is Scattered and can show up anywhere on the reels in order to earn a payout. Spin up three or more anywhere to earn the Free Game Feature. 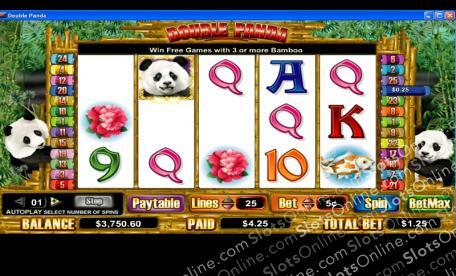 Enjoy the sights and sounds of the wild in this enchanting Double Panda slot. The Bamboo is Scattered, can show up anywhere on the reels, pays out up to 100 coins, and activates the Free Game Feature when three or more are spun up. The Panda is Wild and can be subbed into any winning combination. If you land all five on an active pay line you will receive 10,000 times your original wager.